Can You Wait to Play Where's the Gold? 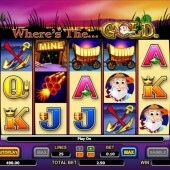 Where's The Gold was brought online by Aristocrat through their partnership with NextGen Gaming. They have successfully re-created the same look and feel at the land-based version. All the characters, symbols and sounds match the slot machine you find in the casino. The game is based on a gold prospector, who is digging up riches in the mines. During the bonus round you realize that this miner has competition and you can select him or one of the other miners to dig out your bonus feature. 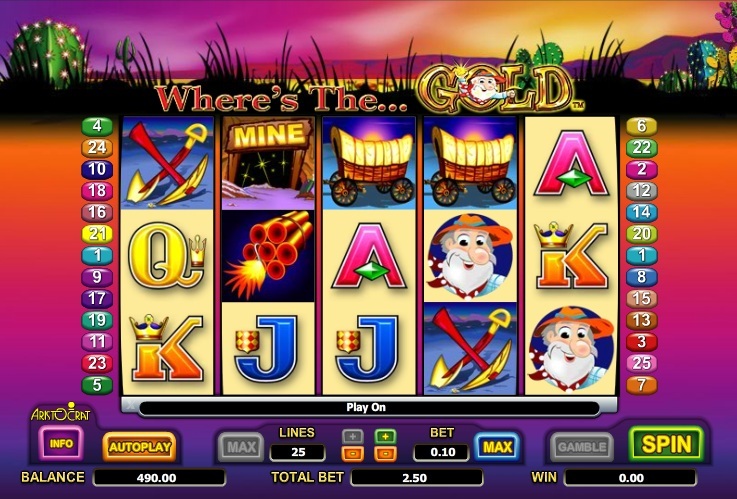 There is a free spins bonus round in Where's The Gold, which is triggered by getting three or more Scatters (dynamite symbol) on any of the 5 reels. You then pick a character to do find some gold for you, who gets a limited time to build up your free spins and extra Wild symbols. I always want to get lots of extra Wilds, as these can really boost your wins. You do see what the other prospectors would have dug for you, which sometimes makes you feel sick if they dig out a load of Wilds. For those of you that always pick the same character, I have it on good authority that it is completely random as to which one digs the most gold. I would encourage you to not keep picking the same person, as you will probably have better luck going with your gut feeling. This popular slot, which made its name in land-based casinos, is bound to be a hit online. It is not as volitile as other Aristocrat slots, such as the oriental-themed 5 Dragons slot. That means that you will get regular wins in Where's The Gold, but they generally wont be as big as those in slots with higher volatility. Other Aristocrat slots that have been released online include the iconic Queen of The Nile slot and the heroic Zorro slot. There are more expected in the coming years as the Australian slots maker looks to increase its profile on the web. It certainly makes sense for them to release more, as the popularity of slots like Where's the Gold is huge.